Di Vino is a dream born between what is divine and worldly. The devotion for exquisite food and wine. Mediterranean cuisine with specialties and our own created recipes that will take you to a culinary tour where your palate will enjoy a broad range of flavors. Location: 12 Street, Playa del Carmen. Aldea Corazon offers traditional Mexican cuisine in a unique setting. Upon entering this hidden gem, you will be transported into a luxurious Mayan garden setting. Here you will enjoy fresh steak and seafood accompanied with a wide selection of wines from Mexico and the World. This Argentinean Grill will amaze you with its wide variety of charcoal grilled cut meats as well as a large range of appetizers, seafood, pasta & salads. 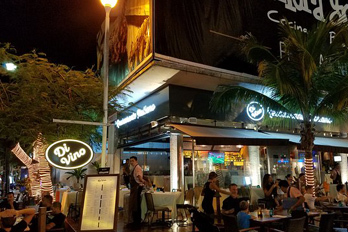 Its privileged location on the heart of 5th avenue in Playa del Carmen, only 1 block away from the Caribbean Sea, will enhance your dining experience being the perfect spot to enjoy the most cosmopolitan pedestrian avenue in all Latin America. Harry´s Prime Steakhouse and Raw Bar now located off of 5th avenue in Playa del Carmen. This stunningly beautiful fine dining establishment, one of the Anderson´s Group of Restaurants, is sure to meet and even exceed the demands and expectations of an exacting public seeking a truly exceptional culinary experience. What really characterizes Harry’s goes beyond its beauty and location. It is the extraordinary high quality of its gastronomic offering. Located in the new section of the fifth avenue, manages to create the perfect atmosphere between the elegant and bohemian of Playa del Carmen ,being the best choise of Italian food for a delicious romantic dinner after a walk on the beach, which in combination with a glass of wine will make your experience something unforgettable. Mexican inspired bar and restaurant located at the famous 5th Avenue in Playa del Carmen where you can enjoy delicate dishes, drinks and beautiful desserts surrounded by a great live music atmosphere.